After all the fighting, Äiti wanted to show that we can be harmonious. Jaava-ninja is expert at snuggling up to whichever mancat she can find. 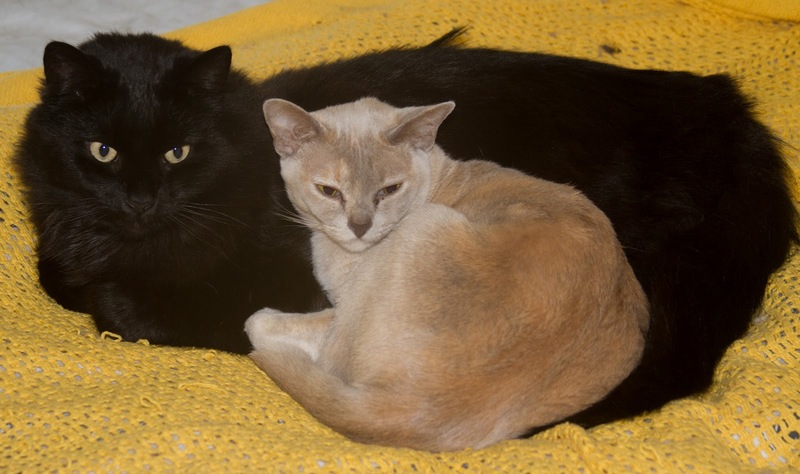 Ruska loves snuggling too so these two are often found together on the bed. Here's to kitty harmony everywhere. And a big box full of kissanminttu cigars (at least one each)! Mum asks if she can join the snuggling duo. They do look comfy! Oh harmony is so wonderful! Nip wars generally don't last too long. Those are some pretty awesome cuddles! How adorable they look together. We love kitty cuddles. Nothing finer!